The unintended consequences of transit planning are embarrassingly many. What planners expected did not happen and the unexpected, proved challenging. In Germany in the 1960′s and 70′s, there was a big push to build subways. Subways were thought of great public works projects and many cities decided to abandon their surface tramways and build subways and it was generally accepted that by the year 2000 only a handful of tramways would be left in operation in Germany. Did not happen that way. Transit authorities ran out of money and taxes skyrocketed as the subways proved much more expensive to build than was originally thought. The subways carried a lot of customers, but overall ridership fell when compared to before tramway abandonment. For many transit customers, taking the car was easier. Subway construction deterred overall transit ridership and greatly increased fares. Transit became user unfriendly. Cities that built with subways, had smaller systems and the cities that opted to keep their urban tramways, saw both a greatly expanded transit systems and much higher ridership! For many cities and politicians, the lessons of subway construction have been ignored, much to the unease of local taxpayers. The unintended consequences of the guided bus is another example. In the 60′s and 70′s, transit planners trying to improve bus service came to the conclusion was made that buses had to be more tram like and thus was born the guided bus. Kerb guided, where small vertically mounted wheels guided the bus via a raised kerb. Rail guided, where the bus is guided by a single rail embedded in the street or bus way. Optically guided, where the bus was steered by an optical system, following lines on a road or in a variation, by an embedded metallic cable. All three variations were produced and marketed, but revenue service showed that for all the extra costs for guided bus, they did not attract the transit customers, unlike trams. Today, guided bus, which to replace small trmways, was itself replace by the tram. Locally, combining rapid transit expansion with densification has had the opposite results than that were intended. As affordable apartments were torn down and developed into high rise condo’s, rents became unaffordable and those who were most dependent on transit had to move to areas where rents wee cheaper and transit poor. Former Premier’s Glen Clark flip-flop from LRT to SkyTrain in the late 90′s is another example of things not quite going to script. After the Expo Line went into operation, it was soon found out to be very expensive, not only to build, but to operate and maintain. A large numberAi?? of of academics, engineers and planners, spent a lot of time planning for LRT to be built on what was then called the Broadway-Lougheed Rapid Transit Project. Political shenanigans by the provincial NDP government with Bombardier and SNC Lavalin and the NDP flip-flopped from LRT to the proprietary SkyTrain. Instead of getting a vote “getter” with SkyTrain, most people washed their hands of the party and the flip-flop helped contribute to the embarrassing loss in 2001 and the two seat rump for the next Parliament. Today, the Mayor’s Council’s 10 year plan for transit in the region is strictly amateur hour planning, where the two big items, the now $3 billion 5 km Broadway subway and the estimated $2.5 billion, 11 km Surrey LRT, will not take a car off the road, rather they will greatly increase the cost of transit, yet provide a shoddy service. With Road Pricing and/or congestion charging just around the corner, the NDP may face having no seats after the 2021 elections. We shall wait with baited breathe for the unintended consequences of the much ballyhooed Mayor’s Council’s phase two plans. VANCOUVER (NEWS 1130) ai??i?? While the paralysis on municipal funding for Lower Mainland big transit projects has subsided, an urban planner is cautiously optimistic about the ways the Metro Vancouver mayors and TransLink plan to collect the money. On Friday, the Mayorai??i? ?s Council announced its blueprint to cover its $2.5-billion share of the $7-billion worth of upgrades for phase two of the Mayorsai??i?? 10-Year Vision for Metro Vancouver Transportation Plan. The plan includes charging developers up to $600 more per home they build, a model which may hurt a city when it negotiates for public amenities in exchange for building permits, according to city planner Brent Toderian. ai?? ?The cities are going to have less negotiation position because of this new charge because essentially the province is saying some of that now has to go to pay for transit and so it wonai??i? ?t be available for things like daycare facilities, heritage preservation, parks and community and cultural facilities,ai??? Toderian said. ai?? ?In a way itai??i? ?s another form of provincial download.ai??? Phase two of the plan includes a new light rail line in Surrey, extending SkyTrain service along Broadway and boosting overall bus service eight per cent. Transit fares will also climb two per cent starting in 2020, something Toderian says may run counter intuitive to encouraging more people to take transit. Toderian does applaud the shift in the amount of funding municipalities were expected to contribute from 30 per cent to 20 per cent. ai?? ?The trap transit had been put in was it was dependent on local municipalities finding a third of the funds for public transit while just collect eight cents out of ever tax dollar. Itai??i? ?s a recipe for paralysis that we have been in,ai??? Toderian said. Additional funding methods include raising property taxes by up to $5.50 annually per household in some areas starting next year and bumping parking rates by 15 cents per hour. 3) Yeah nice. I kinda agree with you, with Kris Sims on attack, the BCNDP might just hand the next election to the BCLibs. Barely. 4) Still sad though you aren’t pushing more often your Rail for the Valley. You really should be building up support for rail up the Fraser Valley – most of which is outside of the TransLink taxing district, instead of slagging TransLink. Zwei replies: This deal has killed any chance for a regional valley rail service. $3 billion+ for a 5 km subway to nowhere that will not take cars off the road and $2.5 billion for 11 Km LRT that seems to be entirely gold plated and again will not take cars off the road. By the time these two FastFerry fiasco’s are built, it will be highway solutions only and Vancouver will be one of the most unlivable cities in the world. There is good and bad planning. The extension of skytrain to arbutus is good. The bad is it too short. It should go all the way to UBC. The good it will reduce travel time to 10 minutes. The good, Kitsilano will be connected to the network. The LRT in Surrey is bad. Surrey have stated in newspapers before the reason they want LRT is to trap people in Surrey and prevent them from leaving. This is why Surrey wants to put a toll on all bridges from Surrey. Spening $2.5 billion for LRT is a waste of money. The same amount will pay for an extension to Langley. Zwei replies: Really? Who’s bathwater are you drinking? $3 billion to move a peak hour ridership of under 3,000 php to UBC is good expenditure? Faster travel times for who? In fact subways tend to increase travel times, especially on short haul routes. You live in the land of pixie’s I’m afraid. It is a good investment. If you want to get people out of cars, then you need to build faster transit. Electric trains are better for the environment than dirty diesel buses that affect the air quality all along broadway to UBC. According to Google maps. It takes 22 minutes to drive from commercial street to UBC. #99 bus takes 57 minutes. #84/ millenium line takes 53 minutes. A millenium externsion all the way to UBC will reduce travel time to 20-25 minutes which makes it competitive to driving. Right now, I rather drive than spend almost 1 hour on a bus. A lot people on the west side of Vancouver do the same because it is faster to drive. A millenium line extension will convince me and many other to switch to take a transit. It will attract new users. If you want proof. Compare the ridership numbers of the former #98 bus to Richmond to the currenter ridership on the Canada line. 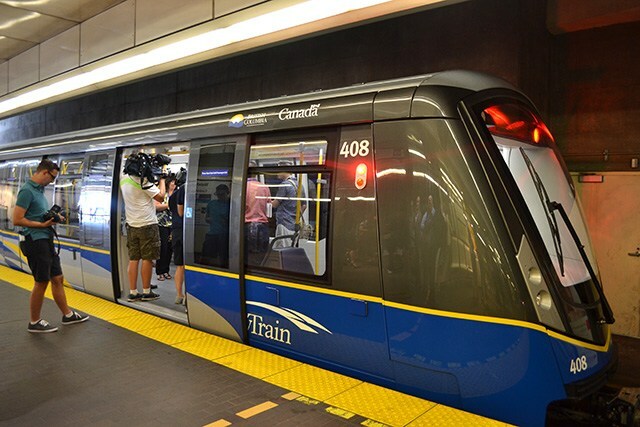 Canada line increased ridership because the train reduced travel from 1 hour to 25 minutes. When people have a fast transit then are more likely to use it. There is worth spending billions to build the subway. It will attract more development on West broadway to replace the 1 floor commercial buildings. This would be similar to what is happening on Cambie street. Just look at marine drive and cambie. Zwei replies: Sorry vine, you have it all wrong is is not the speed of the transit, rather the speed of the portal to portal trip. One must factor it total trip time, number of transfers, and if one has a seat or not. Fast transit is a myth, rather it is the user friendliness of the transit system, ease of ticketing, speed of the overall trip, lack of transfers, etc. that attracts people to transit. One thing you really need to mentioned in your blog is, German cities are equipped with advanced S-Bahn system, and have less urban sprawling issues than north american cities. They are the reason why the speed of subway was rendered useless at long distance. S-Bahn are by its nature faster than subways, and most of the important area is already covered by S-Bahn since there is not much urban sprawling, so there is no need to built subway to cover the area that might never be covered by S-Bahn. For Vancouver, we don’t have a S-Bahn system, although we really should have one but I don’t think this is going to happen in recent years. We have far less urban sprawl issues than other North American cities of similar size (e.g. Calgary, Portland), but it is still much more severe than German cities. Without greatly changing the urban planning strategy, for the City of Vancouver, there is no other options than subway. Zwei replies: S-Bahns are actually tarted up LRT systems. Calagary’s and Edmonton’s LRT were coped after German S-bahn. Also for guided buses, there are some recent (~2017) trends that rely on Deep Learning based optical guiding system, which are much cheaper than the traditional optical guided system developed in the 90s. They are still in test phrases but should be mature by 2019. Had they been put into service they would be better than tram in all means….except for snowy condition. So while it might not be useful for Canada, warmer places will say farewell to trams in the future. Zwei replies: Liability concerns have also stalled optically guided bus. The problem is, public transport needs people to deal with people. Besides the high rent cost of Vancouver is not caused by the densification. It is caused by the large foreign investment made to Vancouver, which is going to happen regardless of the choice of transit system this city has, and had also affect areas that are not even dense (e.g. Lions Bay). German cities have a rather stable changes in rent cost, but this is because every one I know who is interested in property investment in Europe goes to London, UK. Zwei replies: High rents are due to the fact older, cheaper accommodations are torn down for new and expensive ones. Blame who what you will, demovictions are very real and causing a lot of hardship, as well driving people away from the very transit, that was designed for them in the first place. The problem with the new generation of optical guidance is that, even if it works it can’t handle the huge number of buses you need to run to actually make a BRT system pump enough passengers through a corridor. Guided or not. Both Brisbane’s and Ottawa’s BRT network designers discovered that it’s the station capacity that starts to matter if you are trying to come close to the capacity of even simple LRT systems. When service frequency has to be less than one bus every 90 seconds, guided or not, you need long platformed, multiple lane stations. This makes bus based technology of any kind expensive to operate in first world countries. It also makes station design and expandability critical. Most existing guided bus networks just can’t come close to handling the needed bus frequency to approach what most rail based technologies can easily handle. You certainly have not been following the rental market of Vancouver. Old apartment still exists, and their prices are also high because the whole market price had been driven up, regardless of the transit system being used. Zwei doesn’t understand the truth. Millnium extension to ubc will reduce travel time and eliminate transfers for many. Currently anyone from Burnaby and Coquitlam must transfer to a bus at commercial. Extending train to ubc will eliminate this transfer and save time. Zwei replies: Er, no. A transfer still will have to be made at Arbutus and the overall trip time for a very few riders, will not be worth the $3 billion or more investment, nor the $40 million in added operating costs. Compare the travel times on google maps from downtown Vancouver to Richmond centre station. Zwei replies – You are funny 5 minutes faster, not including access time to the stations etc., makes the car a far better choice. Zwei replies: It is not the train trip time that is important but the portal to portal time that is. Even a 15 minute to 20 minute portal to portal or door to door time advantage for transit, still makes the car the first option. By the way the eth2btc.info domain is valid, but is used by spammers and alike. So, I take it that all these spammer domains are the work of a very few people, who are probably working for the SkyTrain Lobby. Get real sunshine’s or are you afraid to rally debate the issue. March 25, 2018: 61 year old woman viciously assaulted on public transit lacking security on board to deal with the many creeps and weirdos (TransLink’s customers) using public transit in Vancouver. In Metro Vancouver with all the crazies on public transit, every bus and especially train needs security. Then, March 28, 2018: feel good story for TransLink to change the narrative. No comments allowed. Heidi doesn’t do “rapid” transit in Vancouver, any more. There are too many creeps on it.